← Euphrosine & Bucha? Instant Pimm’s Cup! January 31, 2018 – New Orleans. Innovative New Orleans distillery Atelier Vie announces the second release of a their two year old Orphan Street Brandy, the first barrel-aged Louisiana grape brandy since at least the days of Prohibition. “Orphan Street Brandy is ongoing series of experimental brandy distillations from ‘orphan’ lots of wine,” Jedd Haas, President of Atelier Vie explained. “Each distillation has been a unique combination of varietals and vintages. It’s an interesting process in which the full results aren’t known for two years, which is the aging period. With this second release, we have achieved a notably different result,” Haas continued. Once distilled, the new-make brandy goes into a barrel, the type of which has also varied for different batches. This second release was aged in a recently dumped bourbon barrel, and the brandy has subsequently acquired a bourbon note as part of the flavor profile. “Who wants to drink immature brandy?” Haas asked. You might wonder about the name of this spirit; but there is an explanation stemming from local geography. Scattered throughout the city of New Orleans, one finds a number of curiously short streets. Church St. in the Central Business District. Architect St. in the Bywater. Madison St., Wilkinson Row, and Clinton St., all in the French Quarter. These orphan streets seem almost like accidents, remnants out of place within the overall grid. Likewise, remnant lots of wine come our way. These orphan bottles are put to good use and distilled into brandy. Orphan Street Brandy reflects this heritage; one of accidental journeys, leftover scraps of geography, and fortuitous crossings. The label contains references to this origin, with typography and design inspired by the street signs of the French Quarter, antique iron work, and the symbol of New Orleans, the fleur-de-lis. 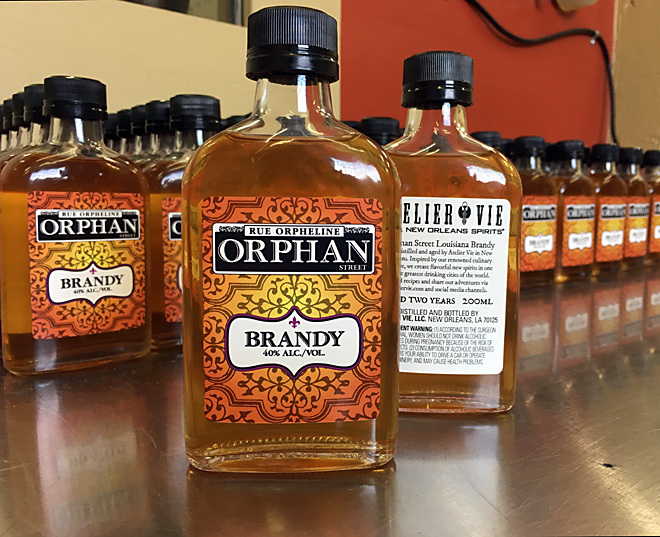 Orphan Street Brandy is bottled at 80 proof (40% Alc./Vol.) in 200ml flasks. Available only at the distillery, the flasks sell for $20 each. Quantities are limited. The distillery is open for tastings and discussion of the distillation process every weekend from 10-2 on both Saturday and Sunday. There is no charge to visit the distillery and the company’s full line of spirits is available for retail purchase during these weekend hours. Visitors should see the company web site for directions and additional details. In addition to Orphan Street Brandy, Atelier Vie distills Euphrosine Gin #9, a flavorful American gin; and also distills a barrel-aged version of Euphrosine, called Barrel-Finished Reserve, which is aged in American whiskey barrels. The Atelier Vie line-up also includes Toulouse Green, Absinthe Verte, a traditional-style absinthe based in part on French recipes from the 1800s and distilled with Louisiana wormwood; and Toulouse Red, Absinthe Rouge, a “new school” American absinthe colored red with hibiscus and excellent for cocktail mixing. Atelier Vie also sells Buck 25 Vodka; an overproof cane vodka designed for creative mixologists to craft their own spirits flavors through rapid infusion. Inspired by our renowned culinary culture, Atelier Vie creates flavorful new spirits in one of the greatest drinking cities of the world. “Liquor is art you can drink.” Atelier Vie was founded in 2011 by Jedd Haas. “Real New Orleans Spirits” is a registered trademark of Atelier Vie, LLC. This entry was posted in Atelier Vie, Orphan Street Brandy, Press Releases. Bookmark the permalink.